Welcome to Talon Talk, hosted by Jack Milliken ('19), Hannah Gruber ('19), and Isabella Walsh ('19). 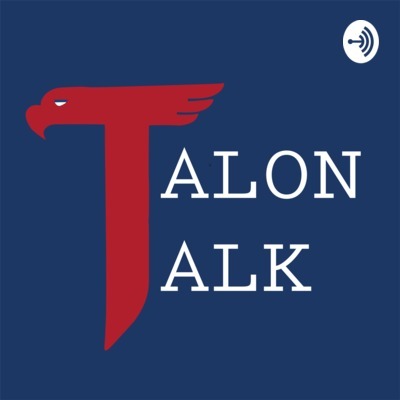 Talon Talk is a podcast that is by the students, for the students. Our hosts focus on bringing outstanding people, stories, and events taking place in the CB community to the spotlight every week. From athletes to musicians, Talon Talk wants to ensure that every Falcon has a chance to share their unique and special story with the world. On this episode of Talon Talk, Isabella and Hannah talk to freshmen Cooper Davey (‘22) and Kennedy Cunha (‘22), who reminisce on their first year at CB, including Homecoming, friends, and finals. Isabella and Hannah talk to social studies teacher Mr. Vince Leporini about his imaginative childhood, life as a teacher and “life coach,” and more. Then, Talon Staff Writer Caty Cordano ‘19 talks about her article “Will You Accept This Rose” about CB's obsession with "The Bachelor". All this and more on the latest episode of Talon Talk. Isabella and Hannah talk to Talon Staff writer Elise Ledesma (‘19) about her article “Senior Year Bucket List.” Then, they explore CB English teacher Ms. Loretta Kenney‘s fun, exciting, and dramatic life, All this and more on this episode of Talon Talk. Isabella and Hannah celebrate Black History Month and discuss CB’s Black Student Union with CB's Education Technology Specialist and BSU moderator Ms. Brittany Williams. Talon Talk Season 2.5 -- Coming Soon! Jack, Isabella, and new co-host Hannah Gruber '19 dish about what to expect on this upcoming season of Talon Talk. Jack and Isabella travel with Hannah Gruber ‘19 to different Sacramento coffee shops to discuss what’s on every students’ mind: Finals. They talk about tips for specific classes, what music to listen to, and many more topics on this week of the Talon Talk. In this episode of Talon Talk, featured hosts Kennedy Earley and Grace Rapaski talk to some of CBs most passionate young politicians: Cece Sidley, Sam Sieler, Sam Copley, and Haley Strack. These four are presented with some relevant issues and express their personal beliefs and voices. All of this and more on this episode. This week we have a mini episode of the podcast where our hosts talk about Thanksgiving! We also hear from the rest of the Talon Staff and some special guests about what they are thankful for. In this week’s episode of Talon Talk, the girls take over and spill some Talon Tea! Isabella and Izzy catch up with Talon writers and CB seniors Sara Littlejohn, Kennedy Earley, Hannah Gruber, and Grace Rapaski. They discuss relationship and dating scenarios and get that tea kettle brewing! All this and more on this edition of Talon Talk. In this week’s episode of Talon Talk, Jack is flying solo. He talks with Talon Moderator Mr. Anderson ‘07 and Religious Studies Instructor Mr. Elorduy ‘03 about music consumption when they were in high school and the digital download vs. streaming eras. Jack also talks with Talon Staff Writer Sarah Louie about her Talon article on live music. All this and more on this edition of Talon Talk. In this episode of Talon Talk, our hosts talk to CB Religious Studies Instructor Fr. Frantisek Murin about his life and wild adventures. We dive into his humble roots in Slovakia, his former soccer career, and what it's like living with eight daughters. All this and more on Talon Talk. In this episode of Talon Talk, our hosts talk to George Cunningham '40 Performing Arts Center Manager, Tech Factor coordinator, and Theatre Arts teacher Ms. Heather Christianson ‘01 about her journey from being a CB student to CB staff member. This week’s featured Talon writer is Joaquin Romero (‘19), who talks about his article “Two-Wheeled Testimony”, which dives into the Uber-sponsored Jump bikes that have been sprung up around the Sacramento area. Welcome to season 2 of Talon Talk! In this episode of Talon Talk, we meet the new co hosts: Izzy de Mattos and Isabella Walsh. Join us as they talk about their expectations when they were entering high school and how those have evolved since then. After kicking back at the illustrious Gaylord Opryland Resort in beautiful Nashville, TN for the STN Convention, Jack and Jon catch up with two of CB’s award winning video makers Colin McCarley (‘18) and Christian Groen (‘18). With an inside scoop on the stress of the production, good times within the group, and the excitement of the award ceremony, this episode is a must listen. In Part I of the latest edition of CB’s #1 podcast, our hosts Jack Milliken (‘19) and Jon Berkley (‘18) talk to junior Anthony Sweha (‘19) and Mr. Brendan Hogan ‘95 about one of Christian Brothers most illustrious programs: KBFT. This week’s featured Talon writer is the talented Delaney Bird (‘18), who talks about her article “Birds Of A Feather Support CB Together”, which touches on her experience in a household heavily connected with the CB community. All of this and more on this episode of Talon Talk. In this special extended episode of Talon Talk, Jack and Jon speak to five members of the CB community about the roots of the Lasallian lifestyle: the five core principles. First, Mr. Havey ‘80 speaks on his spiritual experience and the impact the core principle Faith in the Presence of God has on his life. Then, student body president Zachary Lau (‘18) talks to our hosts on how CB has nurtured him by Christian Brothers’ perseverance to maintain the core principle Quality Education. Talon Talk Episode 3: Did Hamlet Have Clout? In this episode of Talon Talk, Jack and Jon talk with Jacob Cherry (’18), the star of Christian Brothers High School’s fall production of Hamlet, and first time stage manager Jennifer Roberts (’18), about the months of hardwork they have put in to deliver another stellar play to the CB community. This week’s featured Talon writer, Mary Enos (’18), gives our hosts the briefing on CB’s new favorite word: clout. And on the newest edition of Talon Tunes, the boys recommend a new single from Vance Joy, the same artists who brought you jams such as “Riptide” and “Mess is Mine”.